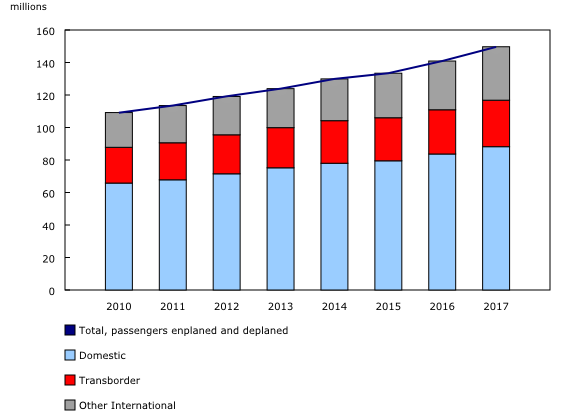 The number of passengers enplaned and deplaned at Canadian airports reached 149.6 million in 2017, an increase of 6.2% compared with the previous year. This marked the eighth consecutive annual increase in air passenger traffic following the economic slowdown of 2009. The largest airports contributed significantly to the strong growth in passenger traffic, with increases seen at Toronto/Lester B. Pearson International (+5.9%), Vancouver International (+8.8%) and Montréal/Pierre Elliott Trudeau International (+9.6%). All sectors experienced growth in 2017, as the domestic sector expanded 5.4% (+4.5 million passengers), other international traffic was up 9.6% (+2.9 million) and transborder traffic (between Canada and the United States) increased 4.9% (+1.3 million). For the fourth consecutive year, the growth in other international passenger traffic outpaced that of the other two sectors. This was fuelled by strong gains at Toronto/Lester B. Pearson International (+9.1%), Vancouver International (+13.4%) and Montréal/Pierre Elliott Trudeau International (+12.6%). These three airports accounted for 88.5% of the 32.8 million passengers who enplaned and deplaned on and off international flights in Canada. The weight of cargo loaded and unloaded at Canadian airports increased 7.4% in 2017 to just over 1.3 million tonnes. Domestic cargo was up 4.0% to 577 000 tonnes. Other international tonnages increased 13.6% to 502 000 tonnes, while transborder cargo was up 3.4% to 234 000 tonnes. This survey collects data on passengers enplaned and deplaned and cargo loaded and unloaded at Canadian airports. With each release, data for the previous reference year may be revised. Cargo data: It is important to note that the air cargo data presented does not represent the total cargo loaded and unloaded in Canada. Comprehensive cargo data are not collected for the following reasons: 1) the regional and local scheduled carriers do not file cargo data on the airport activity survey; and 2) the major charter survey does not collect data on domestic courier cargo or domestic entity cargo flights. Additional analytical information is now available in "Airport Activity: Air Carrier Traffic at Canadian Airports," as part of the service bulletin Aviation (Catalogue number51-004-X).